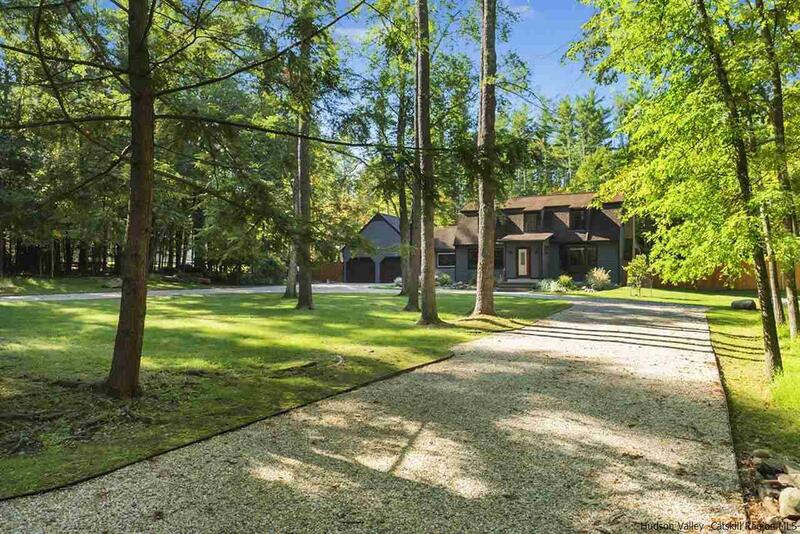 Located on a romantic road in the heart of Woodstock, this perfect contemporary cedar sided home is set far back from the road on a beautifully manicured 2.14 acres. A sizable 3 bed 2.5 bath that boasts a culinary-lover's dream kitchen - gourmet in all its details, custom cabinets, Wolf built-in range, Subzero refrigerator, Bosch dishwasher, spectacular granite counter-tops and stainless steel everywhere, you and your guests will be in chef's heaven. Throughout you will experience a crisp open floor plan with bright hardwood flooring and beamed ceilings. Perfectly placed windows not only let in loads of natural light, they showcase the beauty of the sanctuary created outside, a lagoon saline pool and hot tub flanked by stunning stone work, mature trees and exquisite landscaping. Attached is a large screened porch to relax or enjoy a meal while you survey the beauty contained in the oasis before you. Tucked away on the opposite side of the house is the private circular stone outdoor shower- to top off the luxury vacation experience in your own backyard. No expense was spared in the design and creation of this home, which will be quickly evident when touring the mechanicals of this home that derives a large portion of its energy from its own solar array. Experience Woodstock at its highest level with no compromise.